Total Workshop search results: 30. Displaying Page 1 of your woodworking search phrase STOOL CHILDRENS. This childrens safety stool features cutouts for little hands to hold while climbing to the platform which is enclosed on three sides. Here are the free woodworking plans to build it. 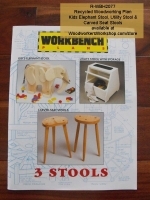 The plan says: This plan packet shows you how to build a 22 inch high three legged stool with a carved seat, a 16 inch wide x 16-3/4 inch high workshop or garage utility stool with storage and a 9 inch wide x 18-1/2 inch high x 26 inch long elephant shaped kids stool. Follow along as we build these fun child size folding stools. This table and stool set is the perfect compliment to the race car bed 25-P4W1003 and tool box dresser 25-P4W2001. This is a paper woodworking plan, a downloadable version is also available. Construct the childs version for tea parties or coloring, using just a circular saw, jigsaw, router, and drill. We chose MDF because it will not splinter, paints easily, and offers a flat, smooth surface. If the adults want a table and stools for their playtime, we also provide a larger version for them as well. The adult set requires just two sheets of pine plywood. These table and stools are easily disassembled to store flat. Everyone will love these puzzle stools. Build a set with these free woodworking plans. Bar height dorm desk designed to be used with bar stools. Adds modern storage, a base support, and is easy to assemble/disassemble.